This 100% waterproof, fully custom-molded die cut system installs quickly without the need to remove any seat brackets or the center console. Finished Look The scrub-able and skid resistant TPO composite surface features an aggressive textured black finish. Easy Install The custom molded kit install easily in using simple hook & loop fasteners so you can easily take individual pieces out to hose off after a long day on the trail. Custom Molded Fully custom-molded die cut to OEM specs for a perfect fit. Insulator The 1/4-inch thick 100% polypropylene foam insulates your interior from road noise and heat. This fully custom-molded die cut system provides a rugged spray-in look in minutes without the need of any labor intensive prepping or removal of seat brackets or center console. The BedTred Jeep liner will replace your Wrangler's factory carpet with a TPO skinned polypropylene foam that is 100% waterproof and has the rugged good looks of a sprayed on truck bed liner. The BedTred material won't absorb water, and will never stain, stink, mold or mildew; dries quickly and resists all harsh chemicals. The 1/4-inch polypropylene foam kit, with provided heat shields, insulates your interior from road noise and heat. Sold separately as front and rear kit or as a combo kit and installs quickly or easily removed and hosed off after a long day on the trail if desired. 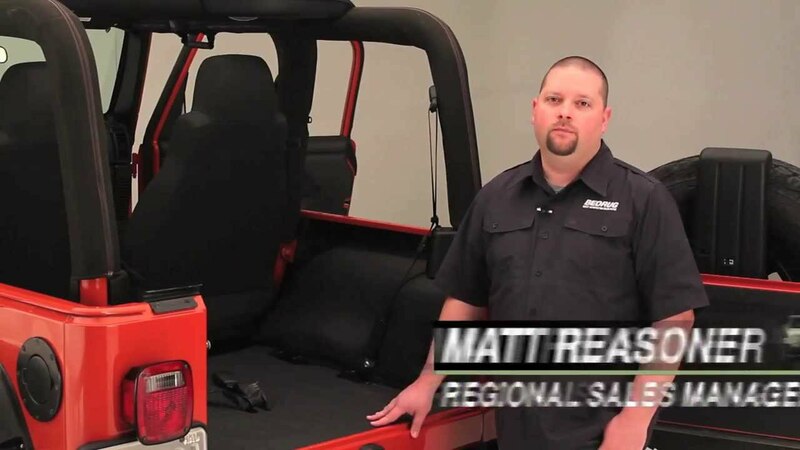 The Bedtred Jeep Floor & Cargo Liners can be installed easily. Each product comes with easy to understand vehicle specific installation instructions.